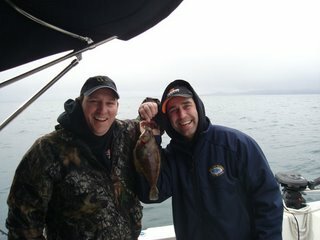 The fishing around Sooke and Victoria has moved from salmon to halibut. There are a few reports of winter springs still being caught, but not too many people are still chasing them. The slot limit has lessened the interest too -- you can only keep wild chinooks that are 45-67 cm. 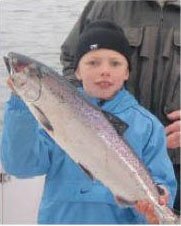 Here's Dylan Yakimovich with a nice one caught off Sooke this week (courtesy of Sooke News-Mirror and Kiwi Magic). The halibut fishing has been very productive, with some days off Victoria's Constance Bank so active that they are being described as a "mini Swiftsure Bank". 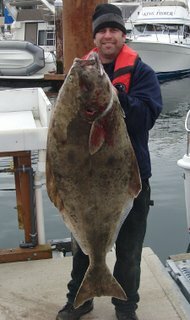 Halibut are also being caught between Victoria and Sooke, and to the west to Sooke, to Point no Point and Jordan River. Trevor from No Bananas Fishing caught a few good ones: "Here's a pic of a 60lbr we caught today at Constance. We also got one around 30 pounds. Dan Perrier was the lucky angler. There are still lots of fish to be had, it's just getting out there between the wind." One teeny one had to go back...he can come back in a few years when he's grown up. The "Just for the Halibut" fishing derby is on in a couple of weeks, April 18-19: "13th Annual Just For The Halibut Derby with BIG PRIZES AND LOTS OF FUN!! First place is $7,500 Second Place is $2,500 Third Place is $1,000 There are lots of other fabulous prizes as well as a special Hidden Weight Prize. Tickets are $50 per rod and include a Just for the Halibut ball cap."